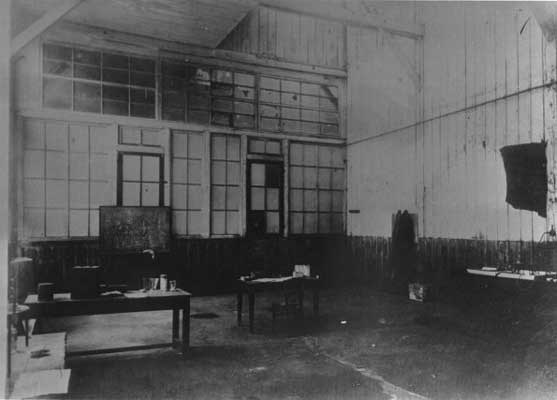 A picture of Marie Curie’s laboratory where she did much of her work on radium. When we read about famous historical figures their accomplishments seem obvious, their acclaim assured. Closer examination often reveals a different story. Marie Curie, for example, almost didn’t get her first Nobel Prize. Even after winning the prize, she and her husband struggled to find appropriate laboratory space in which to conduct their experiments. And, though Marie Curie was the first woman to hold a professorship at the Sorbonne, she was only given that position after her husband’s became vacant because of his death. Most modern observers marvel at Marie Curie’s intelligence and insight. A review of the obstacles she overcame suggest that perhaps her most influential traits might have been determination and courage. Marie had faith in her own abilities, but stronger than that was a conviction that her work was important. Albert Einstein once described Marie Curie as someone who was totally indifferent to fame. She was a scientist. She did hard, grinding labor. She extracted radium and polonium from pitchblende; the yield of this extraction was in minute quantities. The exquisitely slow pace of the process did not deter Marie. She endured physical consequences of her effort–radiation burns and fatigue–without complaint. When World War I broke out, Marie Curie used her scientific knowledge to save lives. She designed portable x-ray units and traveled to the front so she could offer her services to wounded soldiers. Marie Curie did this as she did everything else in her life, with courage, intelligence and a lack of regard for herself. As we read about Marie Curie, and other accomplished figures in history, we marvel at what they achieved. Often, however, the better part of their story may be the road they traveled to realize their achievements. The strength of character displayed in some cases–certainly in Marie Curie’s case–is certainly as noteworthy as the honors earned. Two books issued by Rhythm Prism are dedicated to Marie Curie’s life. One, Marie Curie: Radium, Polonium, is designed for a general audience and the other, Marie Curie: Science Pioneer, addresses the interests of children. Material in both books overlaps, although specialized information about Polonium and Radium are contained in Marie Curie: Radium, Polonium. Marie and Pierre Curie discovered two elements on the periodic table, radium and polonium. One of the difficulties they had in working with polonium was the fact that it kept “disappearing”. What they did not understand at the time was that radioactive elements decay at a regular rate, called its half life. Below is a chart (which appears in the Rhythm Prism book Marie Curie: Radium, Polonium) that shows the process of thorium decay. The chart was the work of Ernest Rutherford, who was himself a Nobel Laureate. Marie Curie: Radium, Polonium and Marie Curie: Pioneer in Science are written in very basic language. If you’re interested in gaining a rudimentary understanding of radioactivity and learning about Marie Curie, both books will serve that purpose. Another book that introduces more information about radioactivity is the Rhythm Prism publication, What Is Radioactivity? The Basics. This book is offered in 6 by 9 and 8 1/2 by 11 workbook version. Reading level is adult or mature student.